This week we started a special project the kids are making to give to you at Christmas. They are so excited! I love spending time with your children during the Christmas season! Their excitement is contagious. We have a countdown for the last 10 school days before break. Each day we pull a ring of the chain, we do a random act of kindness. This week we have written notes to the people who make our lunches, cleaned up our school yard, and made cards for our specials teachers, just to name a few! I pray that God will be glorified in all of our celebrating and that we hold him at the center of it all. Next week I will not be sending a newsletter. We’re heading out of town to be with family very early Saturday morning. Below you’ll find a summary of how we spent the past week and what I look forward to doing with your child this coming week. Before going back to school in January I’ll send an email with a few reminders. May you have a very blessed Christmas! December 20: Christmas Chapel led by our kindergarten classes! You are all welcome to attend! Chapel is at 9:00. Unable to attend? Normally there is a live feed that goes on the ZCS Facebook page. December 21: Classroom Christmas Party. I sent a SignUp Genius out for volunteers. Beyond that, we are set for the party. You won’t have to worry about sending anything extra with your child that day, but they will need their normal snacks and lunch. January 10: All students will begin to attend on Thursday afternoons! I’m looking forward to spending more time with your kiddos! Library books: As a reminder we visit the library on Tuesdays. Kindergarteners at ZCS are allowed to check out one book at a time. If your child would like a new book to enjoy at home, please help him/her remember to bring their book back by Tuesday. It is fine to send it in early. We collect them in a bin under the mailboxes throughout the week. Transitional Schedule Changes: I’m looking forward to all students attending class on Thursday afternoons starting January 10! You may add more afternoons at this date if desired. Please let me know by the end of Christmas break. As a reminder, the week of February 19, you may choose to add afternoons to your child’s schedule if desired. All students will attend class on Wednesday afternoons starting April 10. This date is the last opportunity to add any other afternoons if you wish to do so. Bible: We continued to learn about the Christmas story one character at a time. This week we made Jesus, a shepherd, and one of the wisemen. I love seeing Christmas through your child’s eyes! This coming week we will finish our nativity projects. Please be sure that your child as a shoe box on Tuesday! They will be so excited to put the final touches on and show it to you at home! Lucas 2:6,7 Mientras estaban allí así que dio a luz a su hijo primogénito. Lo envolvió en pañales y lo acostó en un pesebre, porque no había lugar para ellos en la posada. Luke 2:6,7 While they were there, the time came for the baby to be born, and she gave birth to her firstborn, a son. She wrapped him in cloths and placed him in a manger, because there was no guest room available for them. Literacy: We continued to explore adjectives. This week we learned about possessive adjectives- mi, mis, tu, tus, su, and sus. One thing I love about immersion education is the way it empowers students when they realize these touch-sounding concepts are really things they use all the time! My job is to simply help the kids notice the language they’re already using. 🙂 Next week we’ll spend some time reviewing adjectives and focusing more on reading comprehension strategies, specifically making connections and asking questions. I will not be introducing any new grammar or literacy concepts. Math: This week we began counting by 10s’. We also practiced addition and subtraction problems by acting them out outside. 🙂 Next week we’ll continue practicing numbers 1-10, addition, and subtraction. Writing Workshop: This week we finished our list of animals. This has been great practice on stretching the words and listening for the sounds. Next week we will finish our unit on labels and lists by “publishing” our favorite pieces and celebrating! Exploring God’s World: We finished our unit on Earth materials. This week we began talking about needs and wants. We used a writing workshop block to list needs and wants. We also categorized some pictures as needs or wants. I like talking about this topic close to Christmas. We will finish our unit on needs and wants next week. Up in Lights: Taryn was Up in Lights this week! Her parents, brother, sister, and dog came to visit! It was fun to see Sadie do tricks. Thank you, DeJong family! Taryn, you ask good questions, always eager to know more about what’s going on around you. We love you! How can I, as a parent who does not speak Spanish or Mandarin, best support my immersion student at home? 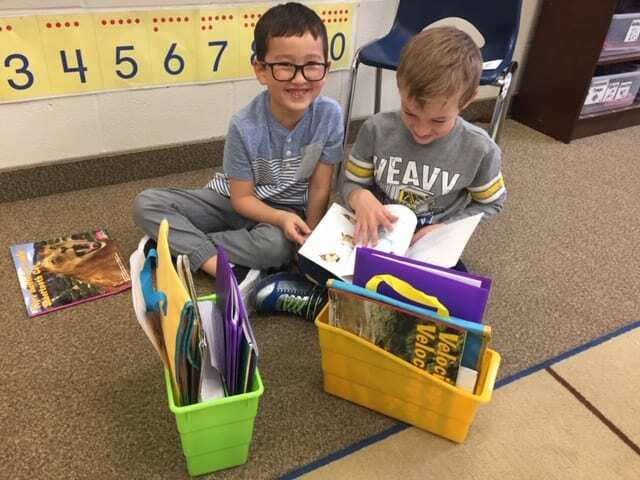 While there are so many ways for you to support a child’s learning, one of the most important things you can do to help your budding immersion student is to read out loud to him/her at home. Besides the benefits of precious time spent together, reading out loud will encourage English growth in your child. Books, whether chapter books or picture books, will broaden your child’s vocabulary and expose your child to different linguistic structures in English. It will encourage a love of books and will also develop good reading habits at home. Research shows us that the majority of parents stop reading out loud to their children much earlier than children lose interest in it, so parents of upper elementary students, your children are not too old to enjoy a book with you! If you are unsure of what to read, there are countless lists of favorite books (mostly teacher created) available online! This entry was posted in newsletters 2018-2019 on December 14, 2018 by mizenbaard.